It’s been far too long since I’ve talked about muffins. These whole wheat pumpkin muffins popped into my mind on Sunday. I had picked up a can of pumpkin puree at the store and was in the mood for some fall baking; I’d already made Pumpkin Pancakes and Pumpkin Chocolate Chip Bread so naturally, muffins came to mind. Now, these muffins aren’t your regular muffins, they are loaded with chocolate chips, pecans and topped with a cinnamon pecan streusel, all while remaining healthy. They are made with whole wheat flour and with no added butter or oil to the actual muffin (there is butter in the streusel topping). These muffins make the perfect treat to bake over this last October weekend and the perfect snack as we transition into November and prepare ourselves for duh, duh, duh… The Holidays. Whether it’s Thanksgiving, or preparations for Christmas or Hannukkah, November and December are often two of the busiest months of the year. So if I were a doctor, I would prescribe you all to make some whole wheat pumpkin muffins, and munch on them while relaxing, whether it be watching a favourite movie or reading a book. Enjoy these last autumn days doing some fall baking and playing in the leaves with your kids and taking them trick-or-treating. *Streusel Topping may be frozen. Preheat oven to 400 degrees and line or grease a muffin tin. In a large bowl whisk together all dry ingredients including spices and pecans and chocolate chips. In another bowl, whisk pumpkin puree, honey, eggs and vanilla. Add wet ingredients to dry ingredients and stir together. At first, it may seem as though there are not enough wet ingredients, but stir and it will distribute evenly. Scoop into lined or greased muffin tins, top with streusel topping and bake for 18-20 minutes. I hope you enjoy these whole wheat pumpkin muffins and this last week of October! i'd sure listen to the doctor and enjoy these at breakfast and at snack time in the afternoon. 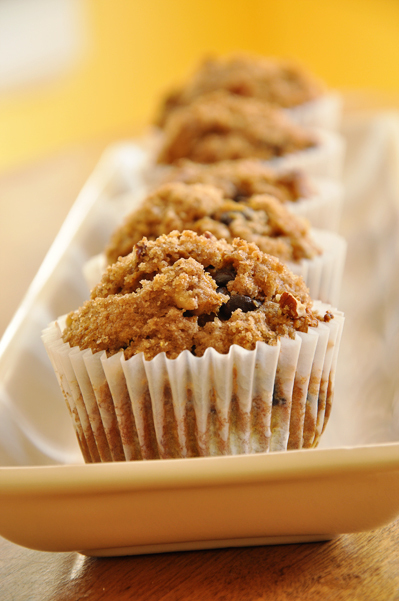 Love pumpkin treats and these muffins look and sound great! This looks & sounds like such a yummy recipe! Must give it a try!